RAILROAD.NET • View topic - What's the deal with Veryfine/Kraft? What's the deal with Veryfine/Kraft? Guilford Rail System changed its name to Pan Am Railways in 2006. Discussion relating to the current operations of the Boston & Maine, the Maine Central, and the Springfield Terminal railroads (as well as the Delaware & Hudson while it was under Guilford control until 1988). Official site can be found here: PANAMRAILWAYS.COM. I haven't seen a tanker in the siding for months now. Re: What's the deal with Veryfine/Kraft? A ~0900/09-27-2013 drive-by confirmed that. The siding is tied in, looks in Veryfine (sorry -- shoulda but couldn't/wouldn't resist) shape, but was MT. Does that have anything to do with the T's Fitchburg Line upgrades? They just placed the new second track in service at Littleton station this week, and for awhile now they've been swapping between new and old tracks to do signal work. So it's possible Veryfine's gone temporarily to truck in the last 1-2 months while the mainline track was getting worked on and they complete the work to get both tracks in regular service. Since the Littleton-Willows work is wrapping now, if they resume shipments in the next couple weeks that was probably the culprit. From here on out all MBTA work trudges from South Acton inbound for the next year until completion of the rebuild project. Only thing going on in PAS territory now is the Wachusett station construction, which won't affect any freight traffic. 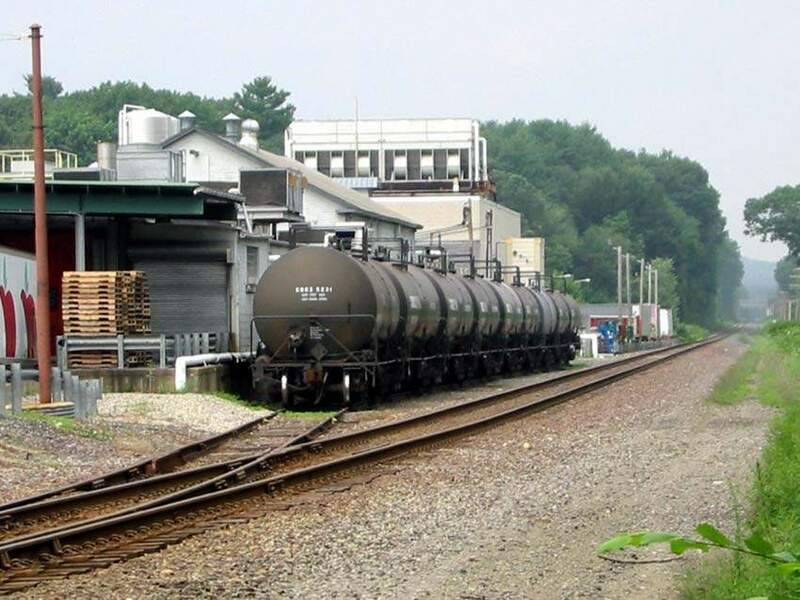 As someone who takes the MBTA's Fitchburg Line every day, I can say that I haven't seen any tankers at Veryfine/Kraft in close to two years- long before the rebuild project got underway from the Willows East. Not sure if Pan Am "lost" them as a customer or not, but the Veryfine's siding has been dormant for a long time. It is still connected though, so perhaps they will eventually come back as a customer. While work on the Fitchburg Line now concentrated from Littleton East, there looks like there is still some work to be done around CPF-WL. Several bulldozers and empty signal shacks have been deposited there in the last couple of weeks. Also, before the Wachusetts Station is ready to come online, a turnout will have to be installed from the Fitchburg commuter platform stub track to #1 Track west of Fitchburg Station. That might present a service disruption to the PAS main for at least a weekend. According to MBTA data last switch was 10/23/2011. This may explain why there hasnt been rail service for a while. But I can't find it on the current CMG website. Not sure if its current or not. If true, I hope that whoever buy/leases it wants rail service. Veryfine is right down the street from me and I miss the switching moves. facility for a 15-year term. Additional details of the transaction were not disclosed." It appears that this is merely a financial transaction, which doesn't explain the absence of rail business. What did they receive by rail? Is it possible they are transloading from the CSX yard in Westborough? Also Pepsi used (do they still?) get tons of Staley or Tate & Lyle shorty tankers of syrup. About an hour ago, I drove across the crossing near Veryfine and there were a couple of hardhat/safety vest types examining the switch at Veryfine. On the way back home, they were gone. Prelude for getting cars again? Sunny Delight has announced the September closure of the former Very Fine plant in Littleton. A couple of months ago Pepsico/CPF purchased the Veryfine plant, to expand their Ayer-based operations. Interesting. Pepsi is already a decent customer and has two well-used switches off the mainline in Ayer. I wouldn't be surprised if freight returns to Littleton.